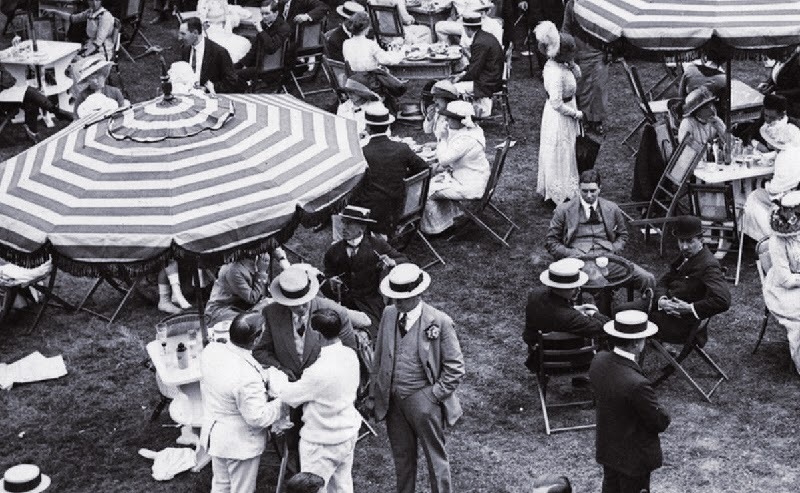 The Deluge offers a panoramic view of the struggle for global mastery that was initiated in World War One and continued to the Great Depression of the 1930s. Adam Tooze argues that America used its position of privileged detachment and the dependence on it by the other world powers to frame a major transformation in world affairs after the war. This was in some respects a liberal and progressive project, but "in its view of America itself, in its conception of what might be asked of America, the project was profoundly conservative." America was the one nation that emerged basically unscathed from the war, raising the all-important question that had been largely erased from the history of Europe in the 17th century: had America become the powerful, world-encompassing empire similar to that which the Catholic Hapsburgs had threatened to establish? She had emerged as a kind of super state, with the power to veto the financial and security concerns of the other major world powers. The Deluge tells the story of change after the war. The death and destruction had left the survivors wondering what to make of the catastrophe. Some saw it as a sign of the impossibility of progress. Others felt that there had been progress but that it was more violent and complex than anyone had expected, and that the path to future progress would be more uneven than any could have expected before the war. Tooze takes the view that developments after World War One were products of an interconnected and dynamic system that is only comprehensible if we view the system in its entirety and retrace its movements over time. It is a story in which the key role is played by America, a new power whose fraught relationship with a world that had changed beyond all recognition by 1918 was both unpredictable and elusive. Tooze's study is comprehensive and thorough. Divided into five sections — The Eurasian Crisis, Winning a Democratic Victory, The Unfinished Peace, The Search for a New order and Conclusion,— The Deluge takes a transnational approach to the war that is in line with many contemporary historians such as Jay Winter and Christopher Clark's (see my review of the "Perspectives on the Great War" conference in London, published in Roads on 10 August 2014). 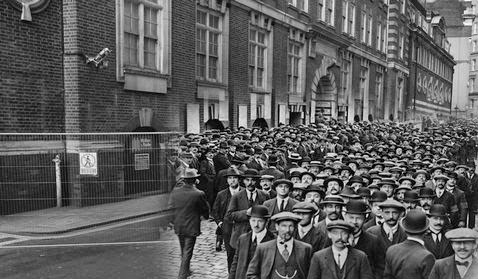 The birth of a new global order, argues Tooze, can be traced back to 1916/1917, when America was placed at the center of world affairs. How this took place and with what consequences is the chief concern of The Deluge. While the approach of Tooze's study is academic, the language is accessible to all. The volume contains a number of interesting photographs and useful figures and tables, and the comprehensive index greatly facilitates navigation within the study. While the copious endnotes are primarily of a bibliographical nature, they also provide useful additional information to the more general reader. The Deluge repays careful reading and is an excellent reference book —particularly for those wishing to trace the effect of the war on America. The Ottoman Empire’s entry into World War I in October 1914 when Enver Paşa, the minister of war, ordered the Breslau and the Goeben, newly acquired battle cruisers manned by German and Turkish crews, to shell the south Russian ports of Odessa, Novorossijsk, and Theodosia. 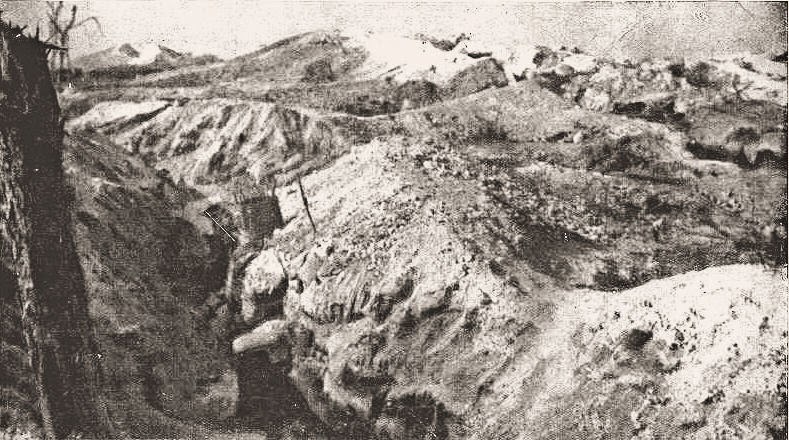 The Russian military commander of the Caucasus took almost immediate action in retribution for the naval attack by marching his ill-prepared army across the border with an objective of capturing the Turkish fortress at Erzerum. Initially the Russians advanced without making contract until they reached the Arras River on 4 November. The Russians managed to push the Ottoman soldiers back, capturing Köprüköy on 7 November, but their victory was short-lived. On 11 November, Hasan İzzet Paşa, the Turkish commander of the 3rd Army, attacked along both banks of the Arras River with devastating results. By 14 November, the Ottoman divisions threatened encirclement by nearly cutting the Russians off from their Kars-Erzurum retreat route. Only the arrival of the 4th Turkistan Rifle Brigade by rail saved the day. Unsure of how strong the Russians were, the Turkish commander broke off combat, allowing the Russians to retain a 40km-deep salient into Turkish territory. İzzet chose not to press any further action with winter so close. Enver did not think in such terms. 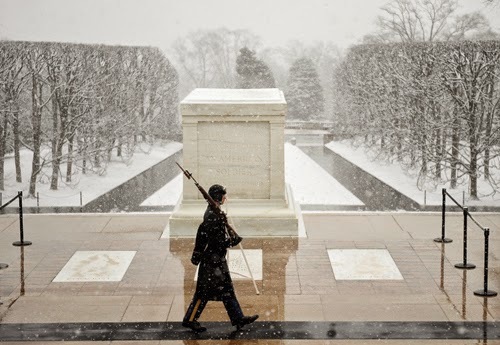 He envisioned winter as the best time to strike because the Russians would not expect such an attack. Furthermore, intelligence showed him that the Russians had centered their forces along the road leading from Erzurum to Kars with an insecure flank on the north. In that disposition Enver saw an opportunity to recreate the Battle of Tannenberg, where the Germans had so decisively defeated a superior Russian force. 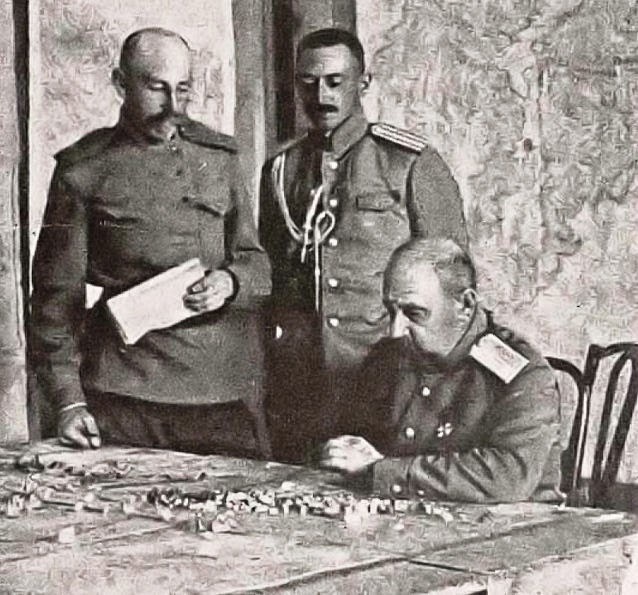 Enver’s plan called for two corps to move around the Russian force’s northern flank while one corps on the Arras River kept the Russians' attention in a diversion. The two encircling corps would capture Sarikamiş, cutting the rail and road routes to Kars, thus isolating those forces on the frontier and destroying them. Enver’s corps would then sweep on to capture Kars and the Caucasian capital at Tiflis. He took this plan to Liman von Sanders, who was the Chief of Staff for the Ottoman Empire’s military. Sanders saw the plan as too ambitious considering the theater and time of year. The Caucasus in winter was a virtual frozen desert. Snow fell in meters and the mountain slopes the army would negotiate were swept by gale force winds that packed ice crystals. Temperatures dropped to nearly polar levels. Sanders reasoned that soldiers would have to endure some of the worst conditions imaginable. In addition, he said that the timing of the whole operation was too constraining. Enver expected two corps to cover the distance of 60 kilometers in five days at elevations reaching 2000 meters on roads that would be barely discernible because of heavy snows. Enver dismissed Sanders criticism and preferred to listen to other German officers who approved of the plan in order to gain favor. Buoyed by dubious but sincere encouragement, Enver decided to go ahead with the plan. Enver’s first act in starting his plan was to relieve the prudent and highly experienced commander of the 3rd Army with himself. He based this decision on the general’s criticism of his plan. Although İzzet saw the plan as doable, he cautioned that the soldiers needed training and practical equipment, a process that would take at least six months. Enver saw the Russians as vulnerable at that moment and not half a year later. The change in leadership led to the resignation and the forced retirement of the three corps commanders. Nevertheless, 3rd Army began concentrating in early December 1914. Its objective was the Bardiz Pass through Id. From the pass, the corps would move on Sarikamiş. The soldiers would move along primitive roads that reached altitudes of between 1500 and 2000 meters. The way would have been relatively easily passed if it were not that it was subject to ice and snowstorms and driving gale force winds. Movement began on 20 December. 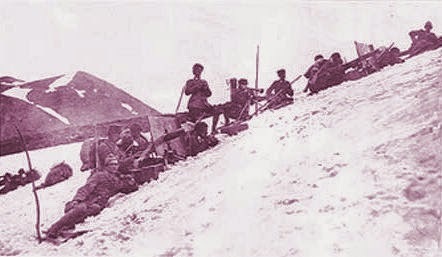 The corps had five days to reach Sarikamiş. The two corps were soon strung out along the roads reaching Sarikamiş in pieces, which allowed the Russians to concentrate their forces for a counterattack that annihilated the Ottoman divisions. Turkish forces had begun the campaign with 95,000 soldiers against the Russian 65,000. By the end of the operation on 3 January 1915, the Turks had suffered 75,000 casualties. Out of the 20,000 survivors, 18,000 were part of the XI Corps that had provided a diversion along the Arras River. For the Russians, casualties were just as devastating. They too suffered from the effects of the elements. There were 16,000 killed and wounded with an additional 12,000 victims lost to disease and frostbite. In one unit alone, the Turkistan Rifles Regiment, 700 men out of 2500 were still effectual. As for the leadership, Enver Paşa never again commanded a military operation. For a detailed description of the Battle for Sarikamiş please refer to the magazine Strategy and Tactics, #290, which is on sale now. Where Have You Seen This Painting? 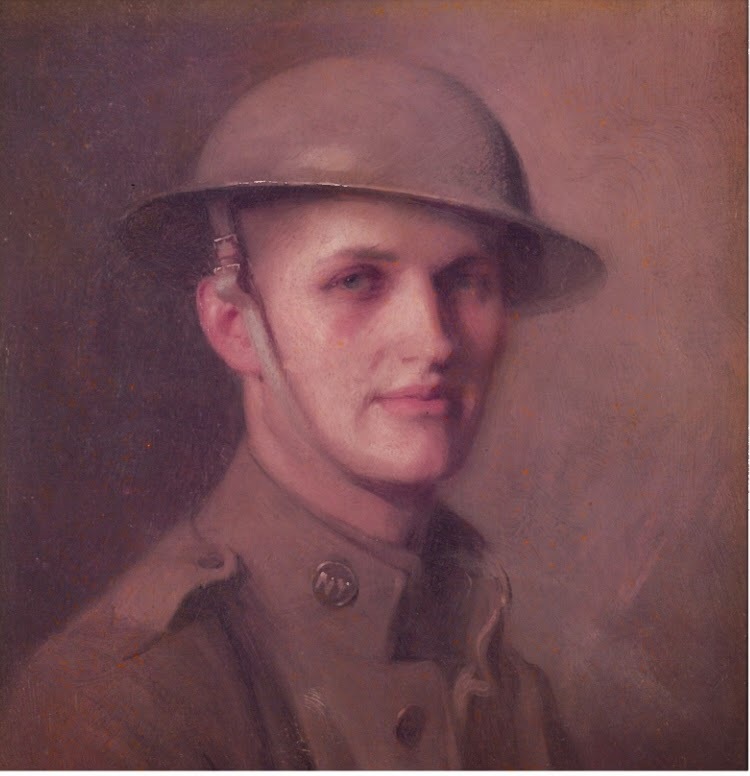 Roads to the Great War has been contacted by the family of the Doughboy portrayed above, Corporal Jack Marqusee, who served with the headquarters detachment of the 27th New York National Guard Division. The image is a from a family-held photo of the original painting. The story that has been passed on over the generations is that Jack's portrait was painted by none other than James Montgomery Flagg and is now hanging in a museum somewhere, possibly in Europe. We are not art experts at Roads, so we consulted some we know. They have reservations that it is Flagg's work. 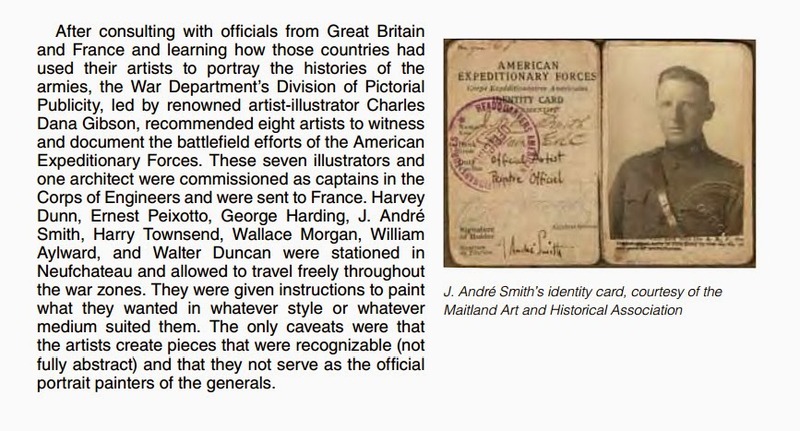 Some think it is more like the war paintings of John Singer Sargent, who had some contact with the 27th Division. In any case, we are trying to help Jack's family locate his portrait. If you have seen it, or have any clues or ideas about its location, please send a message to: greatwar@earthlink.net. 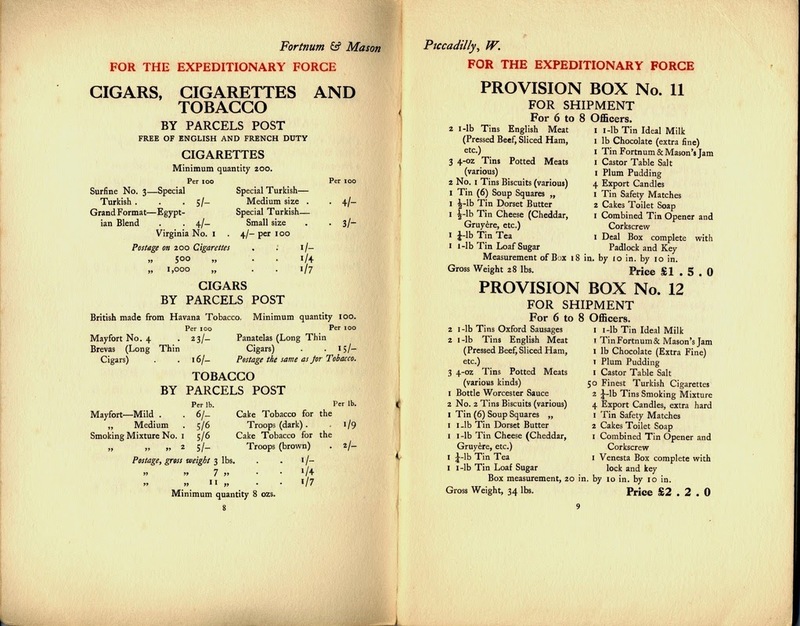 During the operations east of Ronssoy, September 29th-30th and October 1st, while serving as a mounted messenger, Corporal Marqusee carried messages between divisional and brigade headquarters under a heavy shell and machine-gun fire and through a valley which had been heavily gassed. He also assisted in rounding up stragglers and returning them to their proper commands under heavy shell and machine-gun fire. Argonne Forest, Argonne Forest, Soon thou willt be a quiet cemetery. In thy cool earth rests much gallant soldiers' blood. 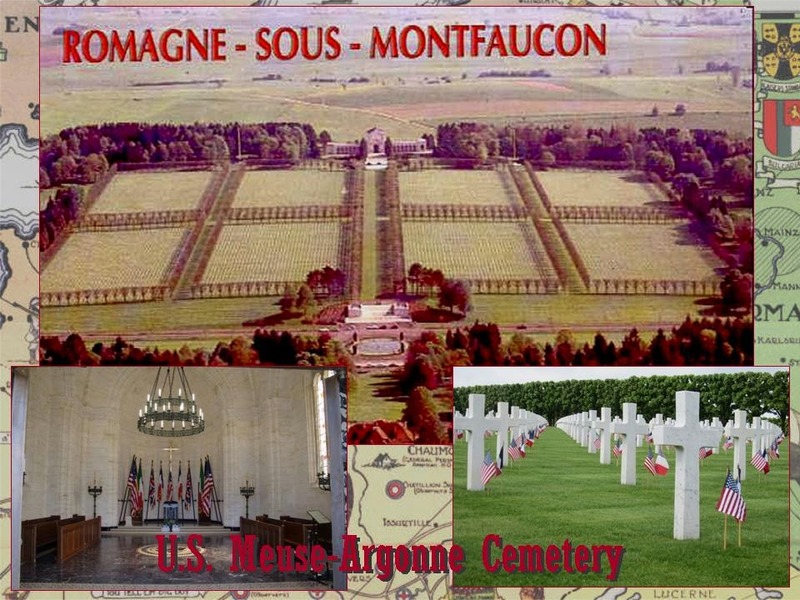 Within the Meuse-Argonne American Cemetery and Memorial in France, which covers 130.5 acres, rest the largest number of America's military dead in Europe, a total of 14,246. Most of those buried here lost their lives during the Meuse-Argonne Offensive of World War I. The immense array of headstones rises in long regular rows upward beyond a wide central pool to the chapel that crowns the ridge. A beautiful bronze screen separates the chapel foyer from the interior, which is decorated with stained glass windows portraying American unit insignia; behind the altar are flags of the principal Allied nations. On either side of the chapel are memorial loggias. One panel of the west loggia contains a map of the Meuse-Argonne Offensive. 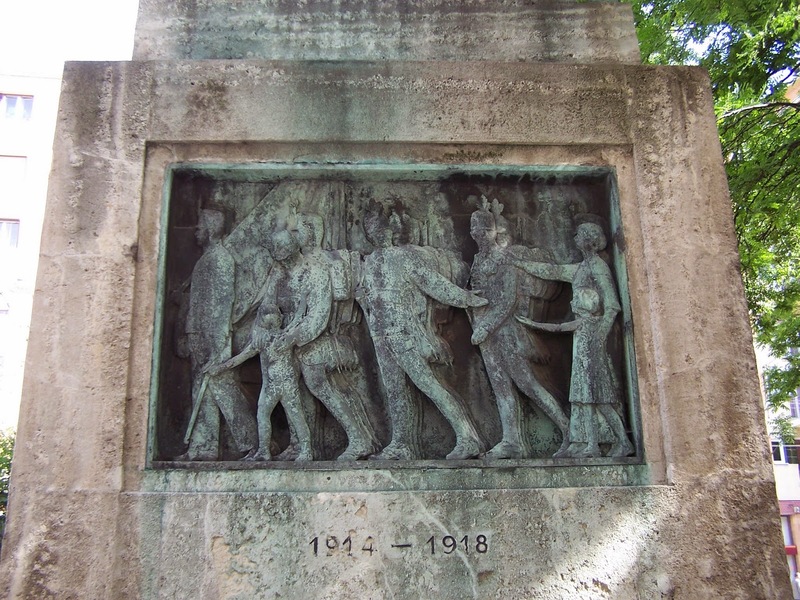 Inscribed on the remaining panels of both loggias are Tablets of the Missing with 954 names, including those from the U.S. expedition to northern Russia in 1918–1919. Rosettes mark the names of those since recovered and identified. 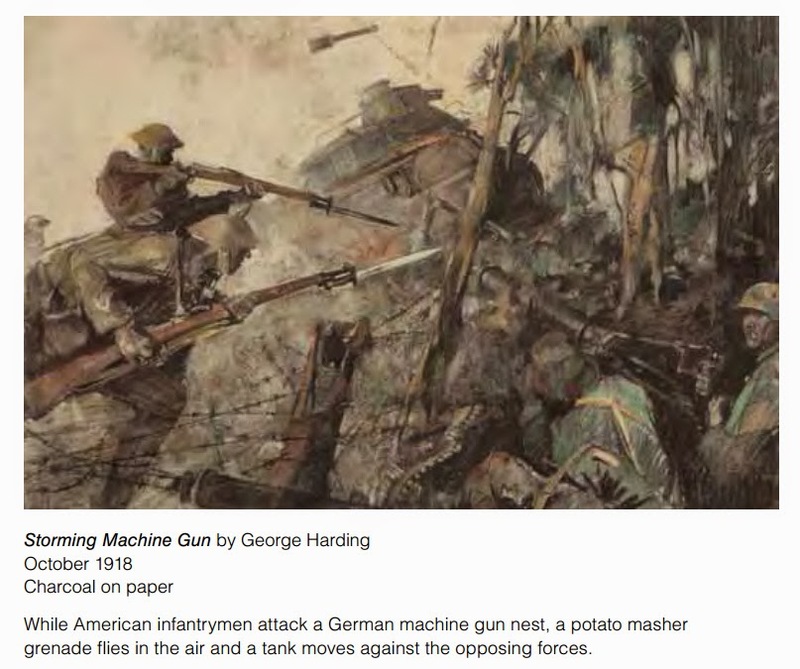 This entry completes our Western Front Virtual Tour for the year. 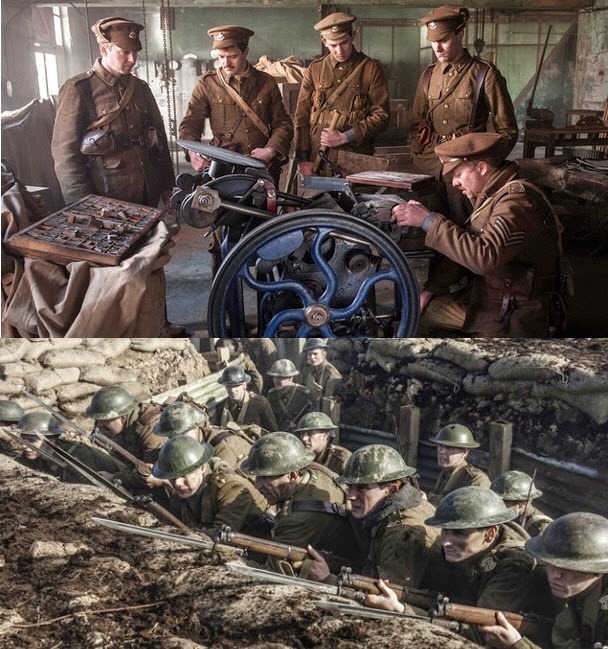 We will be pausing this series in 2015, as we take a look at some of the other battlefields of the Great War. Our examination of the Western Front will resume in 2016 with the battlefields around Verdun when we will continue our reconnaissance of its battlefields. A complete Boche figure suddenly appeared on the parapet and looked about. This complaint became infectious. It didn't take "Our Bert" long to be up on the skyline. This was a signal for more Boche anatomy to be disclosed, and this was replied to by all our Alfs and Bills, until, in less time than it takes to tell, half a dozen or so of each of the belligerents were outside the trenches, and were advancing towards each other in no-man's land. A strange sight, truly! So writes Bruce Bairnsfather about the Christmas Truce of 1914. This event was an outbreak of spontaneous fraternization between troops concentrated almost entirely in the British sector on the south edge of the Ypres salient. Contact occurred in degrees varying from exchanging smokes and chatting or playing football in No Mans Land to sharing meals and dinner gossip in the opponents' trenches. It occurred less frequently where one or both of the opposing formations were elite or hard-edged types. The Christmas Truce has long been looked upon as a symbol of a humanity not yet submerged by the mechanical forces of industrial-age warfare. With its ability to inspire and hold the imagination of later generations, the Legend of the Christmas Truce might be looked upon as a rare positive outcome of the Great War. There was not an atom of hate that day and yet, on our side, not for a moment was the will to war and the will to beat them relaxed. It was just like the interval between rounds in a friendly boxing match. They [the Germans] took me for a corporal, a thing I did not discourage, as I had an eye to going as near their lines as possible! I... then escorted them back as far as their barbed wire, having a jolly good look round all the time and picking up various little bits of information, which I had not had an opportunity of doing under fire! I went straight to HQ to report. The crucial thing to note is that distrust was a feature of this and other truces occurring throughout the war. The English respected a brave and resourceful enemy but there was no love or liking. If there was no hostility, neither was there a relaxation of the will to win; if not that, then at least there was no relaxation of suspicion. And it proved, above all, to be an excellent opportunity for a safe reconnaissance. 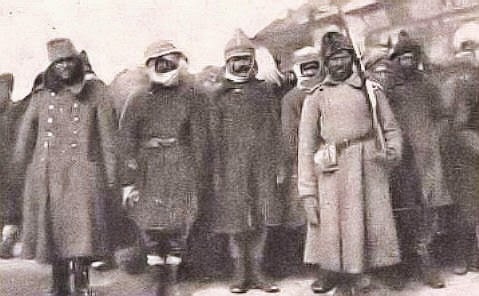 There is no evidence that the truce extended to the French front, which is understandable since they had started a major counterattack in the Champagne on 20 December. The Germans were the invaders and were on French soil. The memories of defeat in 1871 and the loss of Alsace-Lorraine was too vivid in French memory to allow any rapprochement with the hated Boche. Frank Richards, one of the very few "other ranks" to write a book about the war after beating odds on the order of thousands to one by surviving all four years, reports that the French people "were saying all manner of nasty things about the British Army" when they ". . . had heard how we spent Christmas Day." Finally, if the Christmas Truce had any effect on the participants or the eventual course of the war, it was negligible. At the time, it made the various staffs apprehensive, but this was soon put in order. 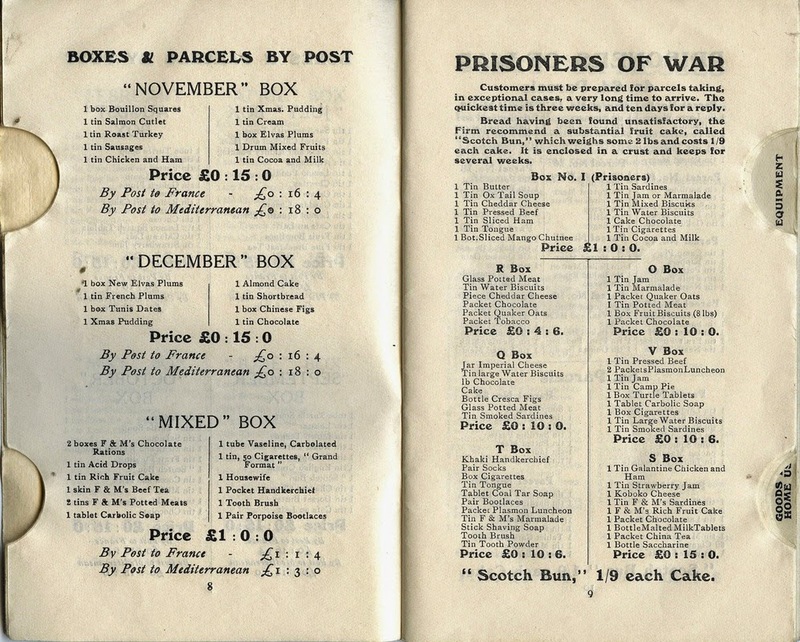 Guy Chapman tells us that a year later "the staff, perhaps threatened by fire-eaters in London, had forbidden all fraternization, and to ensure their orders being carried out, commanded slow bombardment all during December 25th." 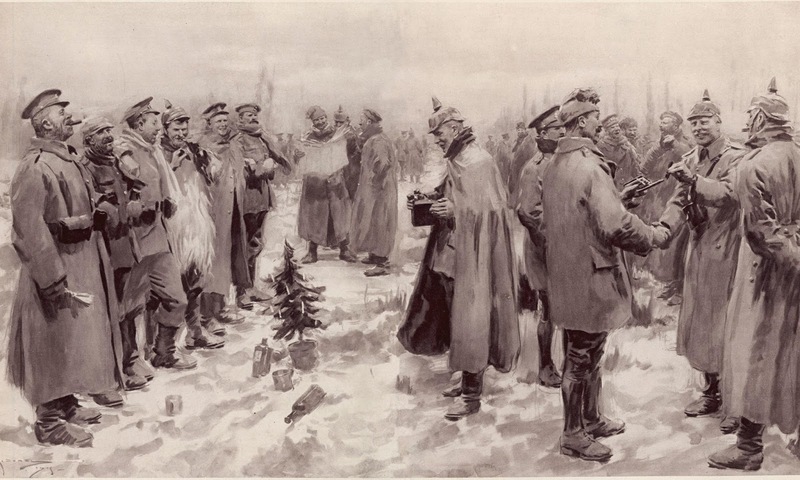 Author Denis Winter reports post-1914 fraternization including meetings in No Mans Land, joint prayer sessions by chaplains and some gestures of civility at later Christmas times. But, as the war dragged on to no apparent conclusion, nothing on the same scale as the 1914 Christmas truce ever happened again on the western front. The historical fiction genre has been a popular one since the time of Sir Walter Scott, and those of us interested in both the novel and the First World War seem to have an increasing number of fine reads to enjoy. One current trend is the mystery "series" novel — a series of novels by one author which follow the adventures of a main character, usually a detective, who is faced with one or more crimes which turn out to be somehow connected to the Great War. In this genre we find the excellent novels of Jacqueline Winspear, author of a series of award-winning books based on the aftermath of the war and featuring the incomparable female detective Maisie Dobbs. Recently Winspear also published The Care and Management of Lies, not in the Maisie Dobbs series but firmly set in the great conflict. Charles Todd is another popular name in this genre. Actually it's the pen name of a mother-and-son team who write books featuring Inspector Ian Rutledge, a haunted and shell-shocked veteran of the war who is trying to pick up the pieces of his career as an investigator. Anne Perry, another popular author (who, intriguingly, is also a condemned murderer herself) includes in her prolific works a World War I series of crime mysteries. Andrew Martin, who has written seven novels featuring the railway detective Jim Stringer, uses the Somme as the backdrop for his murder mystery The Somme Stations. And there are others, such as Edward Marston, whose Home Front Detective Series includes Instrument of Slaughter, which was reviewed on this blog on 25 November 2014. Thus it's not surprising to find writer Rennie Airth as the author of a critically acclaimed murder mystery series based on World War I. Airth's novels feature Detective Inspector John Madden of Scotland Yard and take place in England between 1921 and 1947. Madden has been through the war and still bears the marks of his experience. In The Reckoning, which takes place in 1947, the Second World War still looms heavily over society but is leap-frogged as far as the roots of the crime are concerned. In The Reckoning Madden is enjoying retirement but is quickly brought back to assist when an unfinished letter by a murder victim is found to mention his name. He assists Scotland Yard's Detective Inspector Billy Styles and local detective Vic Chivers in their investigations. The plot quickly intensifies when a distant report of a murdered Scottish doctor reveals an identical method of execution. Soon it becomes apparent that someone is using the same method to kill again. The mystery then focuses on the question of why someone would kill individuals in exactly the same way when these victims appear to have no connections with each other in any way. The detective work takes on an air of intensity when it is clear the murderer is going to strike again. Meanwhile we are treated to a highly detailed insight into the nature of police procedures and detective work before the mystery is solved in a highly surprising and climactic way. I know I came to appreciate more than ever before what detective work consists of — summed up thus by the words of Detective Styles to his superintendent: "You know as well as I do, sir, in a case like this you collect all sorts of facts, but only a few really matter. . ." The gradual winnowing down of a multitude of apparent clues is one of the features of this novel that keeps the reader interested and involved. I have been a huge fan of Rennie Airth's novels featuring John Madden since first reading River of Darkness and had been eagerly awaiting The Reckoning — it does not disappoint. Airth is at the top of his game, engaging the reader with dense plotting, page-turning narrative, and expert characterization. I absolutely could not put it down! Carillons throughout the world will ring out “Silent Night” at 19:14 p.m. on Christmas Eve 2014 to commemorate the Christmas Truce between the German, British, Belgian, and French soldiers on the Western Front in World War I. Seventy-eight participants in eleven countries will celebrate and remember the 100th anniversary of this action of peace. Sixteen of the participants are in the United States. The Carillon of Messines, Belgium, located just north of the most famous truce site, will launch the event at 19:14 hrs, local (7:14 p.m.). Performances in other time zones will follow at 19:14 local time. On Christmas Eve 1914, as darkness descended upon a brutal landscape of trenches and barbed wire, the sound of carols rising from the German lines prompted curious British, Belgian, and French soldiers to raise their heads above the parapet. In the distance, they could see the glow of candles on small Christmas trees. Germans were also seen peering back. No shots were fired. Some soldiers raised their heads higher, and the men exchanged salutations. Enemies inched closer and eventually met. They shook hands, agreeing a truce for the following day. 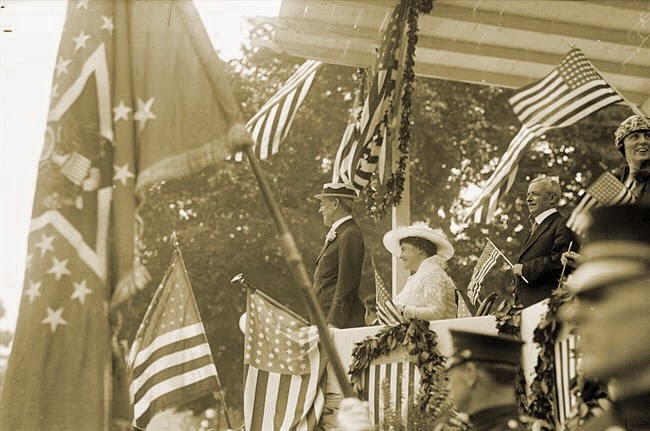 Also, we have not found much media coverage of the Truce Centennial on American media. Cable Network H2's documentary on the truce is the only Christmas Eve presentation we have discovered. Thanks to Carilloner Carol Patton for the heads-up on this. 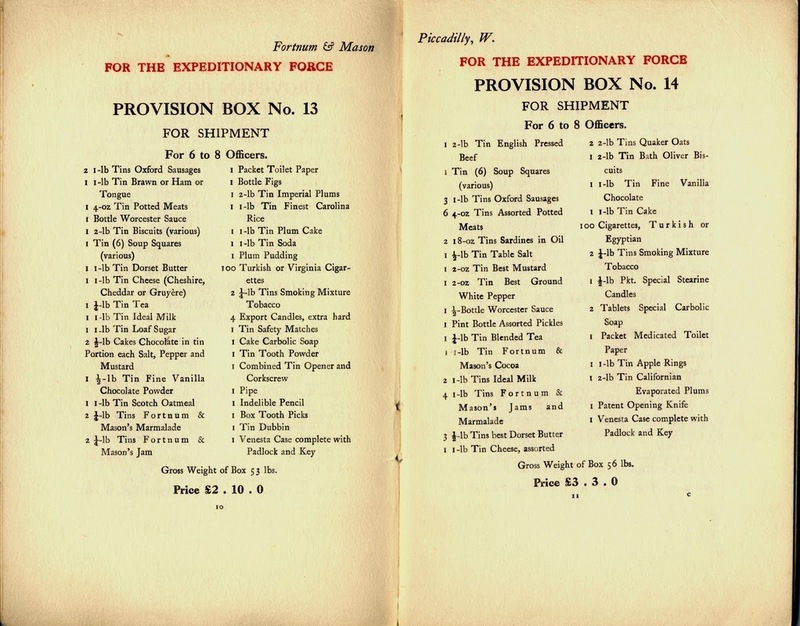 The 1915 catalog (note the black/white, much sparer look) expanded to include other necessities for frontline existence, including a "Mediterranean" version, presumably for those in the vortex of Gallipoli. Perishables and breakables were kept out of these hampers as much as possible. 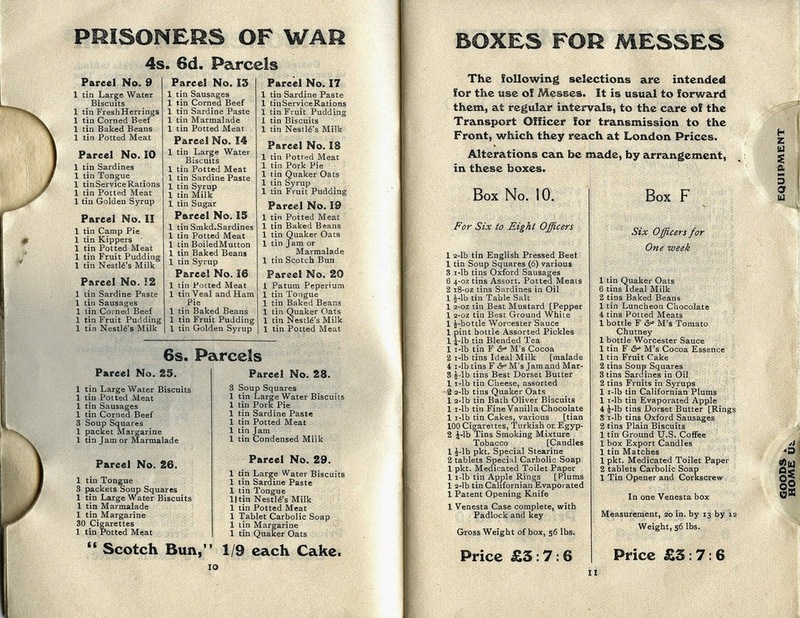 And by hamper we really mean boxes and crates, since the lovely classic wicker hamper from Fortnum's could hardly stand the ravages of wartime transport and storage. Those boxes were useful empty as well. 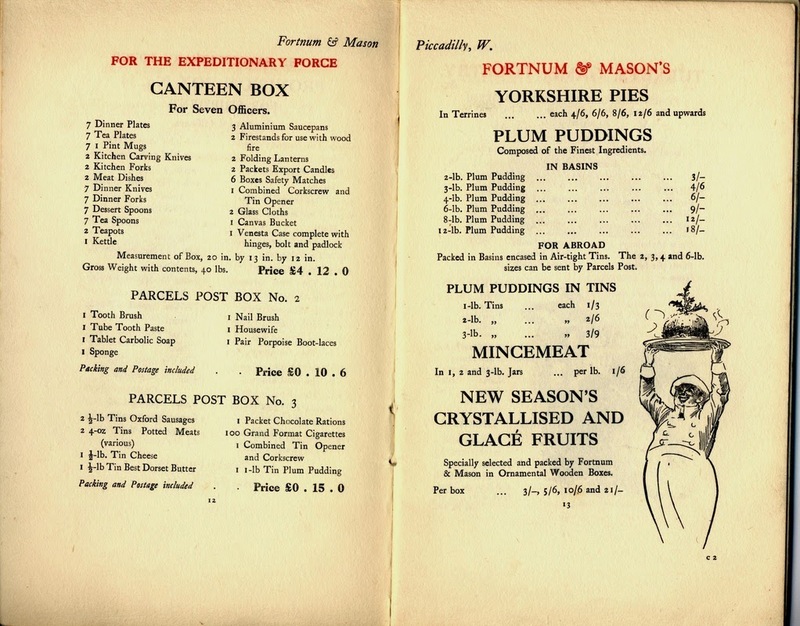 After 1915 it is hard to image these abundant catalogs being made use of, or even available, given the escalating lack of food in Britain with the increased U-boat war sinking much-needed imported food. 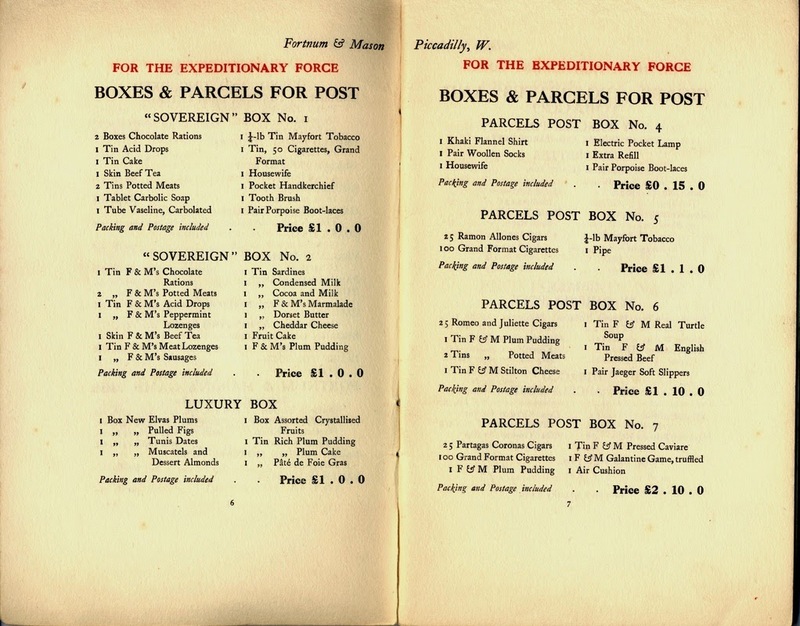 And with official rationing instituted in 1918, this prewar approach to sending treats to the front must have fallen away altogether. 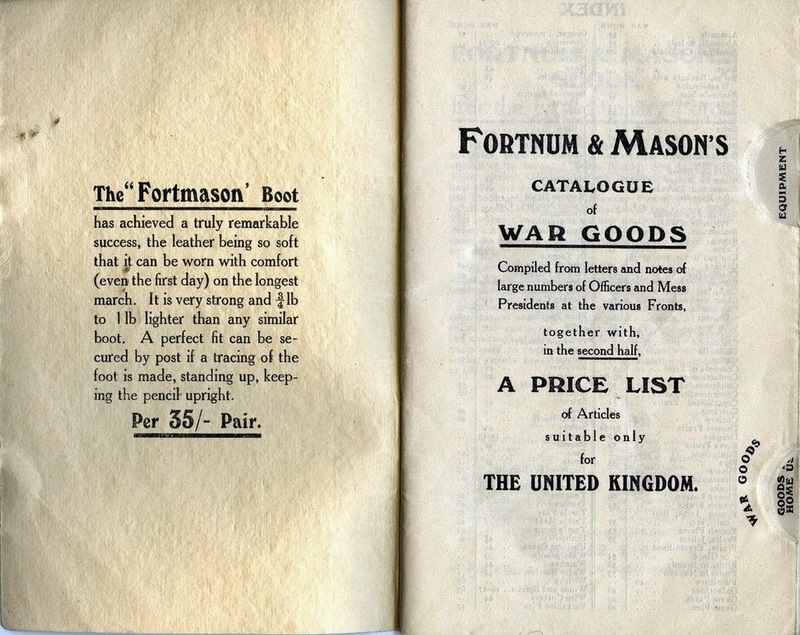 To read through more of these catalog pages and find other Great War historical gems please go to http://www.tommy1418.com/officers.html. The site owner Ian Houghton graciously gave permission for these to be excerpted. I had not seen his site before, but I recommend it. On 23 July 1918, 377 U.S. Navy personnel were assembled at Porto Corsini, under the command of Lt. Willis Haviland. The following day the Italian 263rd Squadron turned over the station and it was commissioned as a U.S. Naval Air Station, under the command of USN Aviation Forces, Italy, located at the American Embassy in Rome. The new commanding officer was the familiar and again-promoted Lt. Cdr. J.L Callan USN (RF), who had set up shop on 25 April. He would be succeeded on 16 October by Capt. Charles R. Train (USN), who remained in command until all personnel were returned to the United States. 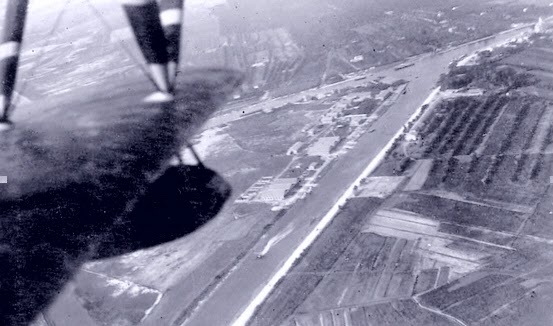 The Italians left 30 aircraft at the site (15 Ma.5s, five Ma.8s, and 10 FBAs), but only a total of five were operational. So Haviland’s first challenge was to repair as many of these as possible. There was a shortage of spare parts, and some of Macchis even had to be returned to the factory to be rebuilt. By the Armistice the Italians had provided only six additional units. The USN had some Curtiss HS-2Ls (with two 400-hp Liberty engines) available in France, but their 74-ft wingspan was deemed too wide for the Canal Candiano. 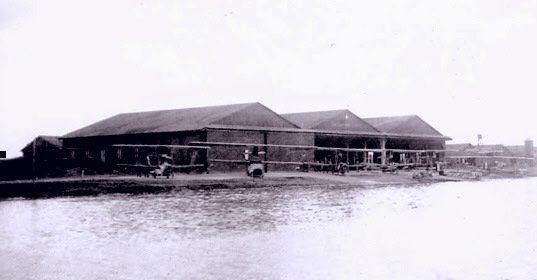 The NAS was built on a manmade island in the midst of a marsh, which the sailors whimsically dubbed "The Isle of Capri". When told that Capri in Italian means wild goat, they dubbed their barracks area "Goat Island City". As a result, the NAS adopted a winged goat caricature as its insignia and this was painted on each plane. Otherwise, the Italian livery was retained to preclude confusion. The enemy were apparently aware of the arrival of Americans at Porto Corsini and decided to give them a warm reception; on the night of 25 July they attacked and dropped about a ton and a half of bombs. Luckily, however, they made a mistake as to the location of the station, and although two large bombs landed within 500 yards of the camp, the majority of bombs hit the marshes and canals farther up the coast. In addition to anti-submarine patrols in the Adriatic Sea, the NAS Porto Corsini was tasked with conducting offensive bombing against the enemy base at Pola. All operations were directed by the Italian Navy district commander at Venice. In the weeks after their arrival, the operational strength slowly grew to five FBAs, four Ma.5s and four Ma.8s. The first attack mission, a daylight raid against Pola, was launched on 21 August. The strike package was five Ma.5s and two Ma.8s. They were met by anti-aircraft fire and five land-based fighters. One Albatros was shot down by Ensign George Ludlow, the first aerial combat victory in U.S. Navy history, but Ludlow’s plane was damaged and he had to ditch. Ensign Charles Hammann would later receive the Medal of Honor (also a first for U.S. Navy aviation) for rescuing Ludlow, but his Ma.5 was damaged beyond repair upon landing. All told, two Ma.5s were destroyed plus a Ma.5 and a Ma.8 had to turn back due to engine trouble. 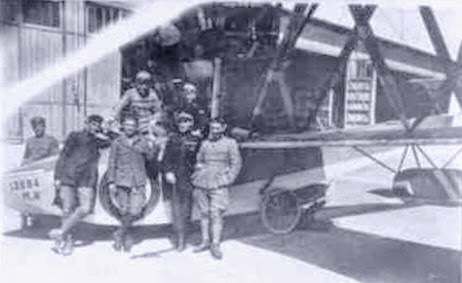 Perhaps not an auspicious start, but the aviators were commended by the Italian district commander and also by Lt. Cdr. Callan in Rome. That night the enemy made another reprisal air raid, but although one of the buildings of the nearby Italian naval station was destroyed there were no casualties. Bombing missions on Pola were mounted almost every night. Ensign Tinkham flew his first combat mission in an FBA, one of four that set out on the night of 28 August. One of these FBAs (not Tinkham’s) was forced down due to engine failure, but was the crew was rescued the next morning by an Italian MAS boat. On 1 September, acting on an urgent directive from the Italian Navy, Haviland sent out his three FBAs on a maximum-range search for a missing Italian submarine (probably the X-1, which was formerly the German UC-12). The sub was found drifting dead in the water and Italian surface ships were guided to the rescue. Another Italian Navy commendation was forthcoming for Haviland, Ensign Tinkham, and the other pilots, and later these men would receive the Italian Croce al Merito di Guerra. On 7 October daylight missions against Pola were resumed, by six Ma.5s headed by Lt. Haviland. Five enemy planes engaged them, but the combat was inconclusive. After the 21 August debacle, knowing that his men were green in aerial combat tactics, Haviland led his Ma.5s in closing with the enemy (who weren’t very experienced dogfighters either). Lt. Cdr. Callan, sitting in his office in Rome, did not believe that commanding officers should lead attacks, let alone engage in combat, and he threatened to relieve Haviland, who paid no attention, and continued to lead daylight raids. Callan then threatened a court martial for disobeying orders. Haviland’s response was: “I wasn’t leading my men – I was too far ahead of them for that". This escalating confrontation was forestalled on 16 October when Callan moved on. Both stayed in the navy; Callan eventually became a rear admiral and Haviland a captain. On the afternoon of 22 October the first coordinated "big plane" raid was staged, in conjunction with 30 Italian planes from Venice. NAS Porto Corsini sent three Ma.8s, two FBAs (one piloted by Ensign Tinkham), and eight Ma.5s, out of a total of 16 operational aircraft. Enemy defenses were ineffective and the damage to the targets was considerable. The last mission flown was an armed reconnaissance by four Ma.5s over Pola on 2 November to ascertain the damage inflicted by an Italian limpet mines attack the previous day. These pilots were the first to report the sinking of the dreadnought SMS Viribus Unitis. Although NAS Porto Corsini suffered no casualties directly due to enemy action, there were unfortunately four deaths from accidents. On 11 August, James L. Goggins, landsman for quartermaster, USN(RF), crashed a Ma.5 and was instantly killed. On 15 September, while testing a new radio, Ensign Louis J. Bergen, USN(RF), and Gunner (R) Thomas L. Murphy, USN(RF), crash-landed in an Ma.8 and died in the hospital at Ravenna shortly afterward from their injuries. George B. Killeen, coppersmith, USN(RF), died on 18 September as a result of burns received in a gas torch explosion. Considering that the NAS was always seriously handicapped by a lack of planes and the spare parts and tools necessary to repair them, the results accomplished were altogether commendable and praiseworthy. The planes which had been promised by the Italian authorities were delivered only in small and insufficient quantities, owing to delays in production and the more urgent need of their own stations elsewhere. Twenty-one was the greatest number of flyable aircraft ever available at NAS Porto Corsini at the same time and with the machines available a total of 745 flights were made during active war operations. Five aircraft were lost: three Ma.5s, one Ma.8 and one FBA. Admiral H.T. Mayo, commander of the Atlantic Fleet, stated on 10 November 1918 that NAS Porto Corsini had "the distinction of being the most heavily engaged unit of the U.S. Naval Forces in Europe." After the Western Front was established General Joffre did not believe he had any choice but to keep attacking the enemy now occupying a major part of France. Also, he could not afford to let the Russians, who feared that the Germans might move massive reinforcements from west to east, believe for even a second that the French were less than determined to hold up their end of the alliance. His attention soon focused on the Champagne Region between Reims and Verdun, where the nearly level rolling terrain broken only by smaller rivers and streams made offensive operations seem feasible. This was, however, at a point in the war when the defensive advantages of the new weaponry and the trench networks still evolving were not fully evident. Attacks were ordered by Joffre all along the massive German salient into France, which had its apex near St. Quentin. 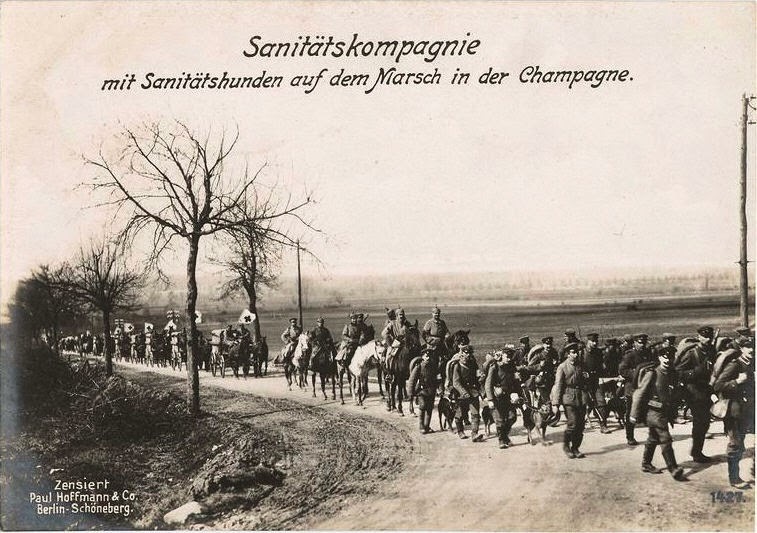 The strongest of these attacks was planned to be on the salient's southside, in the Champagne, mounted by the Fourth Army and (to their east) the Second Army. It was launched on 20 December 1914 with some initial advances, but enemy counterattacks, poor quality munitions, and bad weather hindered anything more substantial. French commanders reevaluated matters and decided to narrow the focus of their attacks. Meanwhile, the German Army strengthened their second and third line defenses. 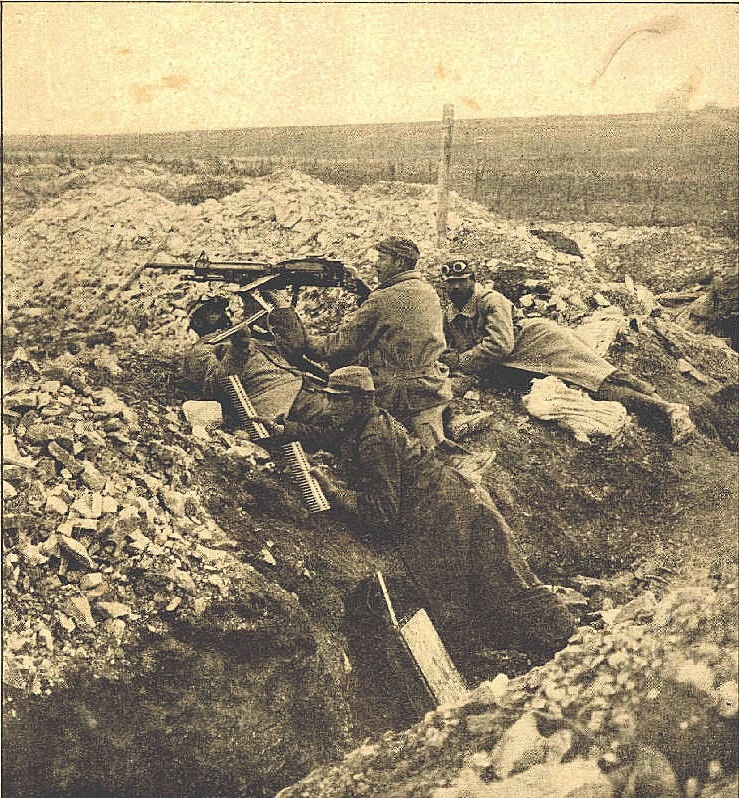 The renewed French attacks began on 12 February 1915, followed a cycle similar to the December assault: initial success, difficulty advancing beyond the first line of trenches, and relentless counterattacks by the Germans. After another pause for rethinking matters, the offensive resumed on 12-16 March but no major breach could be made by attacking on the narrower fronts since any Poilus who successfully broke through were devastated by flanking fire from German artillery. These were the early lessons of trench warfare. It cost the French and German Armies 90,000 casualties each to learn them. This First Battle in the Champagne was but the beginning here — the region would become one of the greatest killing grounds of the war for the French Army. It was the site of major action in every year of the war, except 1916 when Verdun and the Somme occupied everyone's attention. The Champagne would later be remembered as the grimmest looking battlefield of the Western Front. 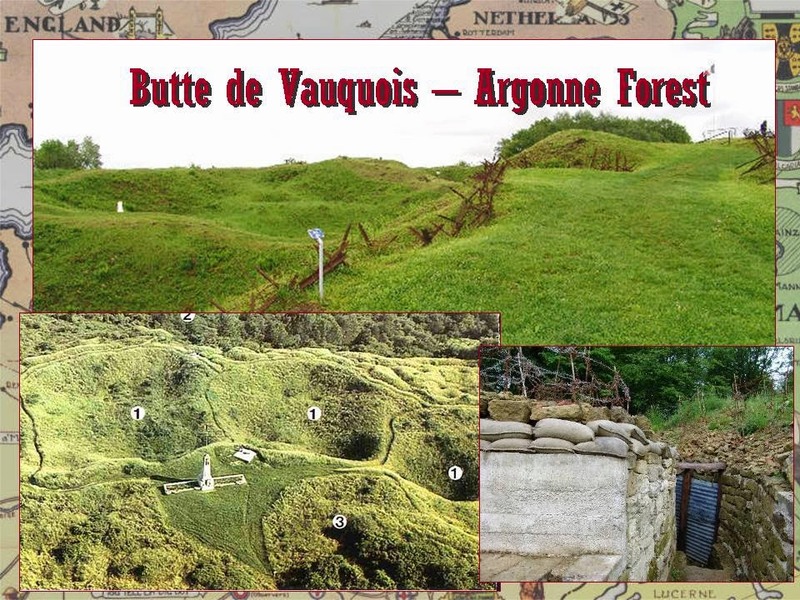 The lost village of Vauquois in the Argonne (Le village disparu) is a testament to the enormity and ferocity of a unique underground struggle of the 1914–1918 war. There are other lost villages in France: Hurlus, Ripont, and Tahure on the Champagne battlefields, and the villages of Verdun that were destroyed and left little evidence of where they once stood. Other areas were mined — the Somme, Vimy, and the Argonne Forest — but it is only at Vauquois that you find surviving evidence of extreme mine warfare that continued below ground well after the village was obliterated, and when there was little hope of a breakthrough on the surface from the infantry of either side. The Butte de Vauquois, where this tiny village once stood, is now just a mass of craters and tunnel entrances. But in 1914 this small hill 290 meters above sea level, with the Argonne massif to the west and Mort Homme to the east, was hotly contested by the Germans and French. It provided a superb observation point for road and rail traffic from the Islettes pass, and therefore, eventually, all movement to and from Verdun. Over the next four years the sappers of both sides exploded an unbelievable 519 mines under Vauquois. What had been a small hill-top village with a population of 168 was a series of mine craters 10–20 meters deep separating the French and German front lines. 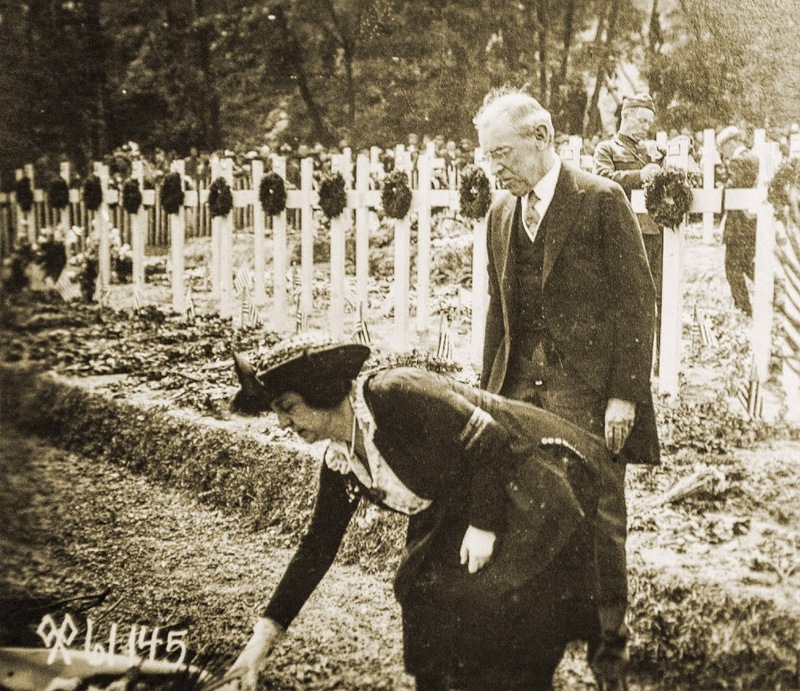 The ground had become the grave to 8,000 missing French and German dead. There was no sign of the church or school that had crowned the crest of the hill — all had been swallowed up by the ground beneath. 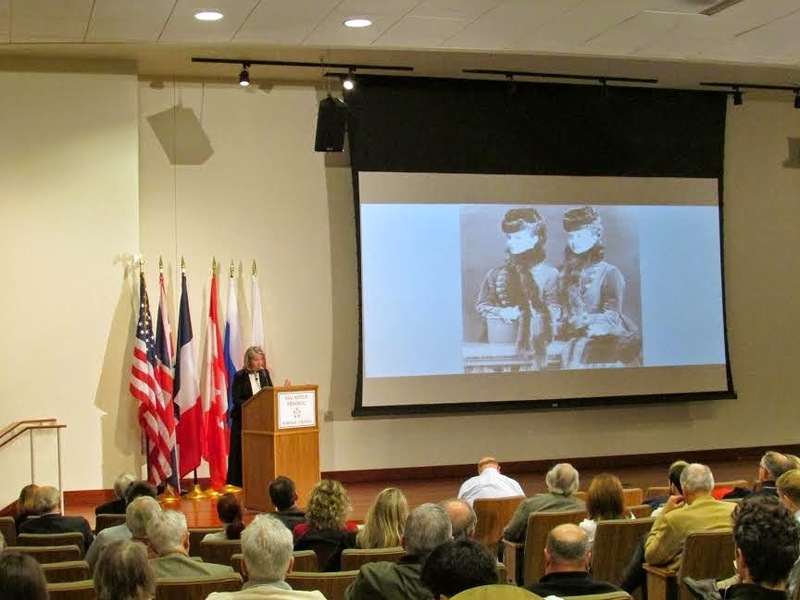 The MacArthur Memorial in Norfolk, VA, held its World War I Centennial Symposium on 14–15 November 2014. Hosting eight authors from the United States, Canada, and Europe, the Memorial partnered with C-SPAN to broadcast the event live on national television. 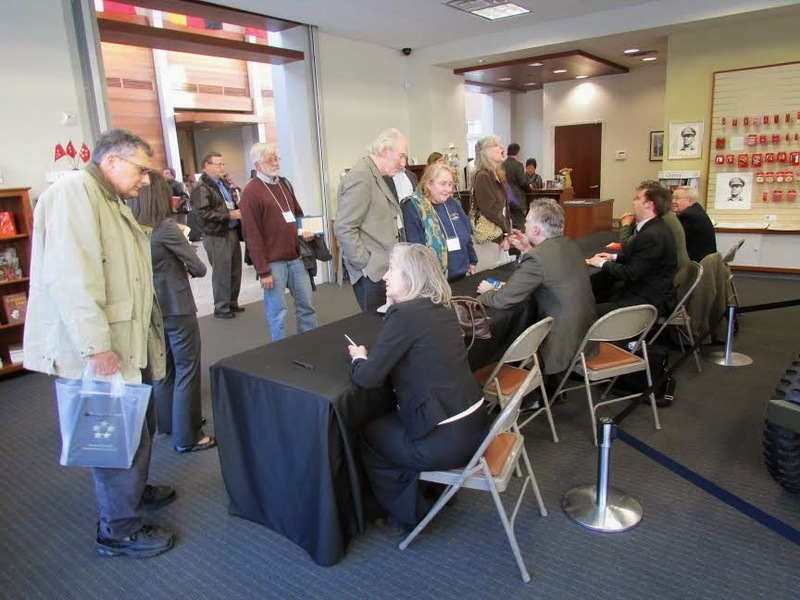 Over 400 people from across the United States attended the two-day event. The symposium covered a wide array of topics focusing on the beginnings of the war with Catrine Clay and Dr. Sean McMeekin, the worldwide scale of the war with Dr. Helger Holwig and Dr. Frederick Dickinson, archaeology of the battle sites with Andrew Robertshaw and Joseph Hoyt, and American neutrality with Dr. Lee Craig and Nimrod Frazer. C-Span will also broadcast the entire symposium on the American History Network / C-Span on December 22-23, 2014. You can also see the MacArthur Memorial’s recent WWI films The Road to War and The Best Laid Plans on Youtube. Please learn more about the MacArthur Memorial at www.macarthurmemorial.org. H.H. Munro, aka Saki, gained popularity before the Great War for his witty and offbeat stories. He could have avoided serving, but Munro enlisted and died at the Somme in November 1916 at age 45. 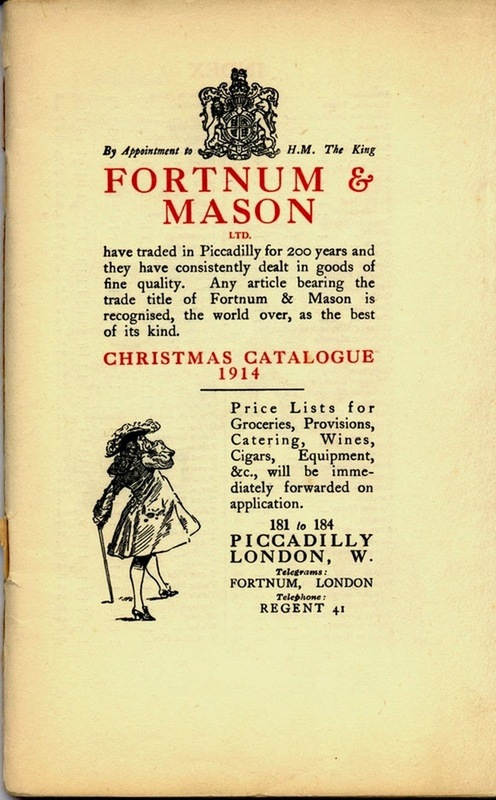 Perhaps the greatest mistake any reader of Great War literature can do is pass up this book. The title can bring to mind another dull overview of the war and its nearly three inch thickness can put off many an aficionado. However, the title and the thickness hide the real purpose of this book. The words 'The People's War' should have had top billing. Alexander Watson, a lecturer in History at Goldsmiths, University of London, has brought about something that many of us look for in a history work about the war but can never find: what made a people continue supporting the war even when casualties reached astronomical proportions? The author effectively delves into the very psyche of the Central Powers' citizens to explain their motivation. Yet he draws other aspects into it also, such as why, considering how many obstacles the ruling governments put into place which thoroughly alienated its subjects, did the people continue to support the war effort? Added to these explanations, just for good measure, is a very detailed description of the people's experience, such as atrocities, dislocation, and genocide, during brief or extensive periods of occupation by a conqueror (not necessarily by the Central Powers). The first chapter of the book is the obligatory depiction of who actually started the war that we have run across so many times. Watson lays out the usual political intrigues and I expected the usual outcome: the Central Powers started it. 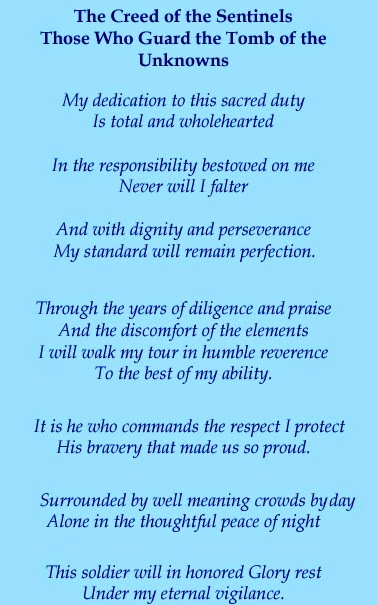 I was pleasantly surprised to find his assessment somewhat more challenging to follow and more reflective in nature. Rather than blame the start on any one person or government, the author brings the reader to believe that war would have been avoidable if only the very people who should have prevented it, the political statesmen, were not so intent on bringing the July crisis to such a fever pitch that it was irretrievable from going to war. They had fully expected to preclude war through their negotiating abilities, which turned out to be woefully lacking and prone to outside influences. They were not the Bismarcks or Aerhenthals that they had aspired to be. Once war was declared and began mutating from a local conflict to the threshold of a global conflict, those statesmen could no longer contain the military and the nationalistic, conservative temperaments of those who followed and took control. Chapter two, once again, begins blandly by explaining the many prewar plans that the Army General Staffs of Germany and Austria-Hungary had for dealing with Serbian and Russian threats to their lands. And, once again, Watson throws in a new aspect. How did the people see their part in the mobilization? Many authors over the years have gleefully pointed to the diversity in ethnic make-up of the Central Powers as the key to their overall failure in the conflict and that such ethnic conflicts surfaced early. The author's research paints an entirely different picture. There was an enthusiasm toward war across all nationalities in both empires, Watson argues, based on the primal instinct of cultural survival. In Germany, the invasion of East Prussia and the ensuing treatment, mass executions and deportations, of native populations awoke a feeling that the war was being fought for survival. 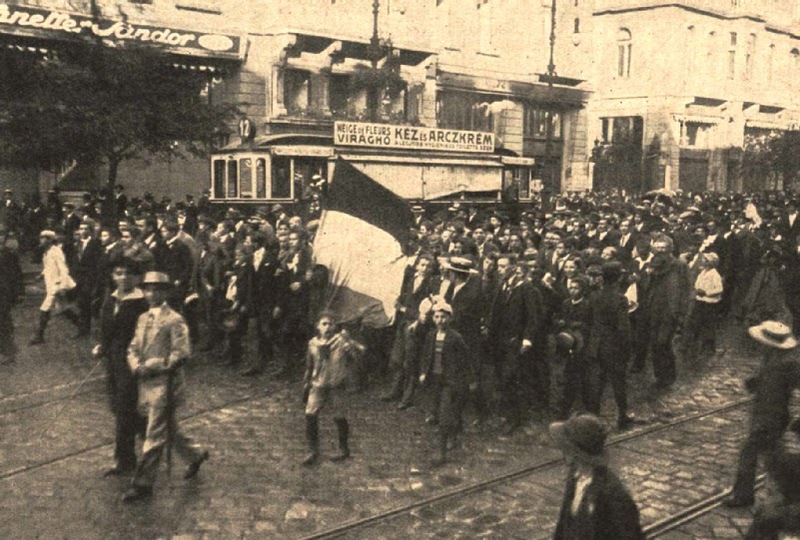 Austro-Hungarian peoples also saw their support of the war motivated by the actions of the Russians as they drove into the eastern provinces. It is singularly important that the governments did not channel this enthusiasm. Instead, they held all non-Germanic populations as suspect to aiding the enemy. Suspected threats, including parliamentary representatives and spiritual leaders, were rounded up and jailed. Community leaders were displaced leaving the greater population adrift in a sea of uncertainty as occupiers looted, pillaged and murdered their way across newly acquired territory. This work is enthralling. As I started each chapter I was initially put off by being fed some commonly noted facts, but my attention was instantly brought back as the author introduced firsthand accounts of what a particular government policy meant to the people. This work takes more of a social history view than the usual diplomatic and military perspectives that we are used to when reading about the Great War. We cannot deny that it does not take heroism to order people into fighting the war, but it does take heroism to carry out the orders. Does Your Loved One Pine for Maconochie with Tickler's Plum and Apple Jam for Dessert? Or has he decorated his den with sand bag walls and duck board flooring? Then, just possibly — like the editors of Roads to the Great War — he is afflicted with Western Front-itis. We know at Roads to the Great War that this is a particularly troublesome malady for their families to deal with at this time of the year. Just what to get them for Christmas? In their personal collections they probably already have an authentic Princess Mary gift box, or Horatio Kitchener or Uncle Sam in a poster calling them to duty, or a Pip, Squeak, and Wilfred medal set. And period clothing, such as that advertised below, is just impossible to find in the 21st century. So, just what "over the top" present can you get for the World War I enthusiast in your life? 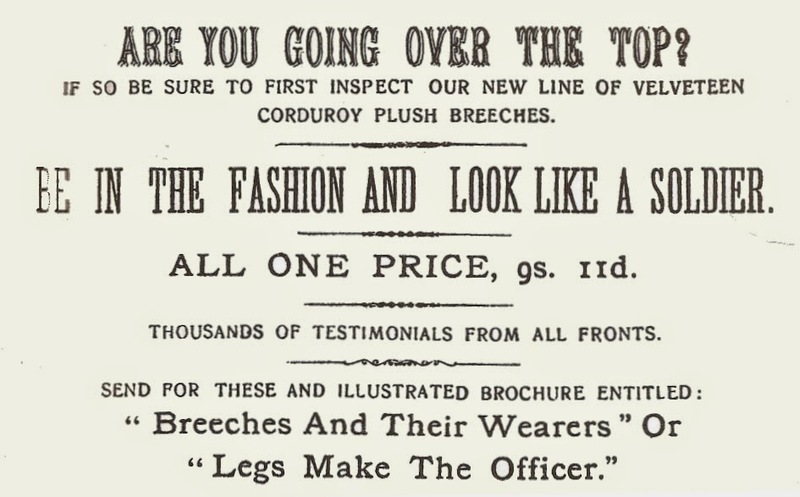 Fortunately, Kimball our assistant editor has been researching this matter for our readers and has discovered the latest "must have" for our fellow aficionados: the story of the Wipers Times. The story of the most famous trench newspaper of the war, The Wipers Times, is now available on DVD and the production is simply superb. The 90-minute dramatization starts with the discovery by Captain Fred Roberts's (Ben Chaplin in a +++ performance) unit of pioneers of a forgotten printing press in the town of Ypres, where they are quartered. After they learn their top sergeant is a skilled printer, and Roberts and his assistant Lt. Jack Pearson rationalize their appropriating it for their own use, they decide to go into the newspaper business. Now as proprietors and editor/assistant editor of a new publication some decisions need to be made. What title? Well only the "Times" sounds sufficiently trustworthy, but it needs its own cachet, so they decide to add the printing location (as pronounced by the Tommies); hence, the Wipers Times was born. What material to present? Well, the new editors, being junior officers stuck in the frontline trenches, instinctively target those above them (the brass), behind them (staff officers), and hovering over them (the Fates, responsible for imposing the calamity of trench warfare). Naturally, the the Times is soon a big hit with the troops and an annoyance to members of the high command and general staff. So if you are looking for the perfect WWI present for someone whose interest in it is boundless, a DVD of The Wipers Times is perfect. What Happened at Hooge Chateau?